If you don’t have a green-thumb or you are away for weeks on business trips cacti and succulents might be your best bet. Even if you don’t have perfectly sunny windowsills or you kill every shrub, these plants are for everyone. Cacti come in many different shapes and colors, and they are real survivors. The prickly spines are actually modified leaves and through their shallow root systems they soak up water that they store for a long time. This makes cactus a very independent plant that suits every condition and every gardener. We just love the minimalist interior of this living room. 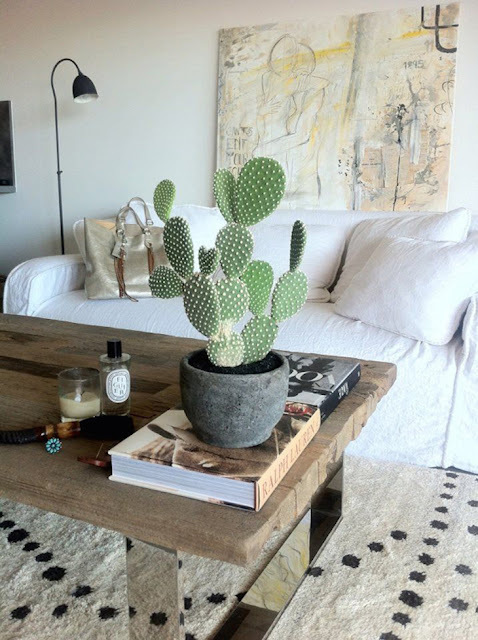 The large cactus in the concrete pot placed on a rustic wooden table adds an elegant and clear look to the space. Concrete material is one of the latest trends in interior design, many designers are now using concrete in unexpected and unusual ways. 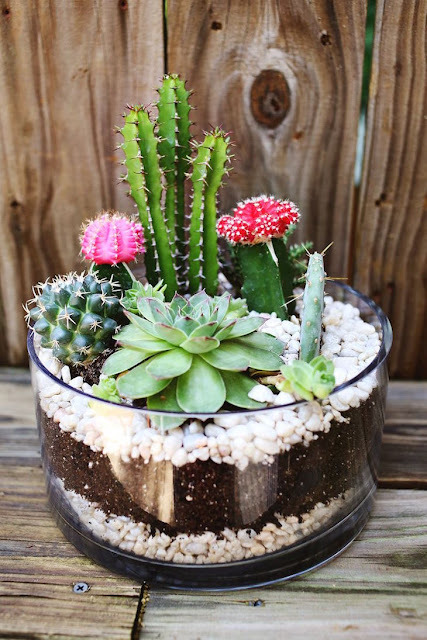 Plant cacti into a larger, see-through glass bowl to create a unique decoration for your home. This way not only the cacti but the soil itself will add an interesting twist to your interior. The different layers of soil, sand and pebbles are not only decorative but also beneficial to your plants. Did you buy a beautiful bowl on your summer holiday from some exotic place and not too sure what to do with it? 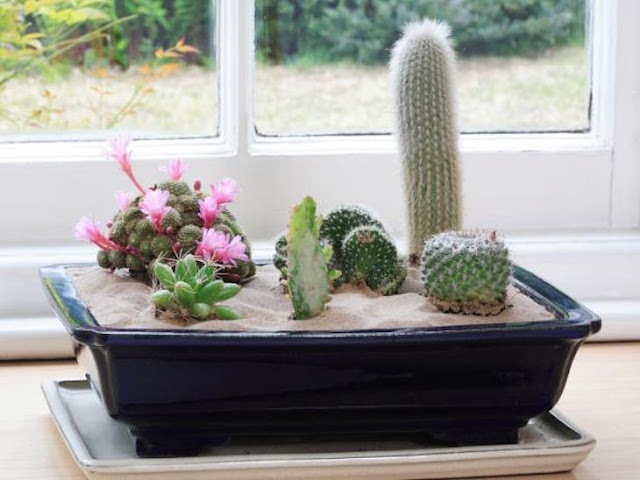 Instead of leaving it empty get some cacti and in similar sizes and create something extraordinary. This beautiful cacti arrangement looks amazing in bathrooms as well. Shallow planing bowls are not only good for Bonsais but also they are perfect for creating your indoor desert. 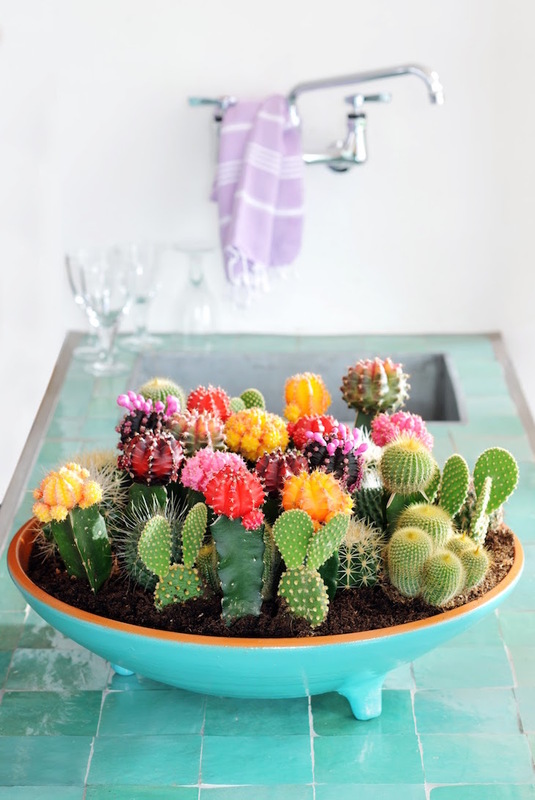 Select different types of cacti and arrange them in a decorative way. Plant the shorter ones to the front and the taller ones behind them. As cacti hate to sit in water make sure to aid drainage by putting pebbles to the bottom of the pot. If you thought that succulents and cacti are not too decorative, look at this beautiful mini garden. With these small prickly plants you can create an perfect centerpiece for your dining room table. Make sure to arrange the plants nicely so that it looks pretty from all sides. 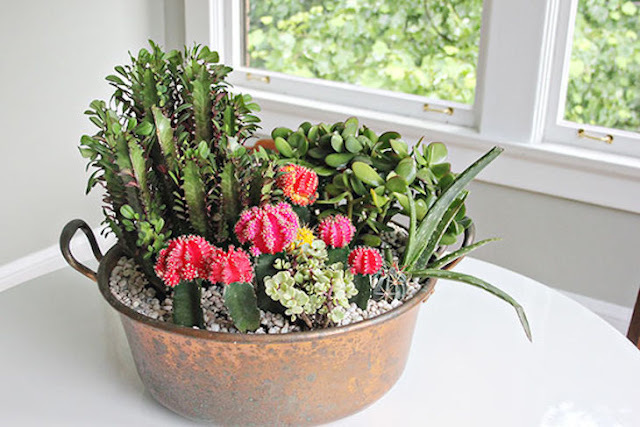 The largest succulents can be placed in the middle of the pot and you can put colorful plants around the perimeter.